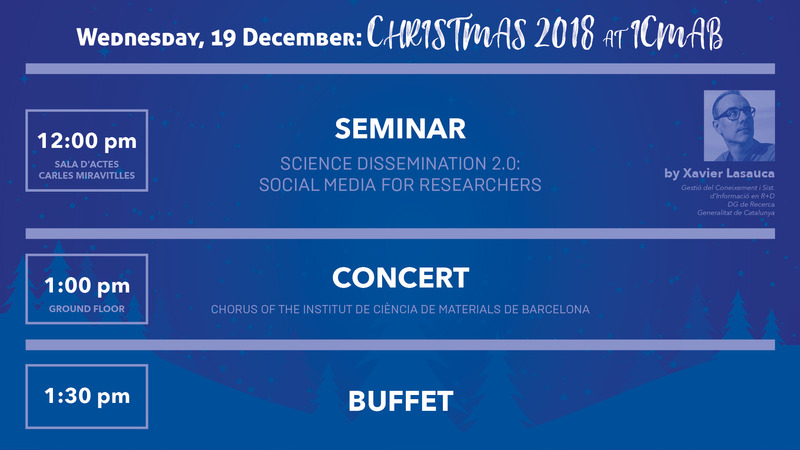 In this seminar, Xavier Lasauca will summarise the benefits which can be gained from use of social media (specially blogs, Twitter and other social networks and repositories) to support research activities, and he will provide examples of these innovative emerging resources as tools for scientific communication as well as discusse their implications for digital scholarship. Theoretical physicist (UAB, 1988), currently works as Knowledge and Information Systems in R+D Manager in the Direcció General de Recerca (Secretary of Universities and Research, Department of Business and Knowledge of the Government of Catalonia). He coordinates and integrates information systems, indicators and statistical data on R&D, coordinates RECERCAT, the electronic research bulletin, and co-administers the profiles of DG Research in social networks (Twitter, Facebook). Since 2014, he gives lectures on the usefulness of social networks for, on the one hand, communicating research and socializing knowledge and, on the other, improving the digital reputation of researchers and increasing the dissemination, visibility and the impact of their research.His blog "The quantum donkey" was the winner of the Blogs Catalunya 2011 Prize in the category of personal blogs of Universities, research and science (Premi Universitat de Girona). Downlad the programme of the day in English and in Catalan.